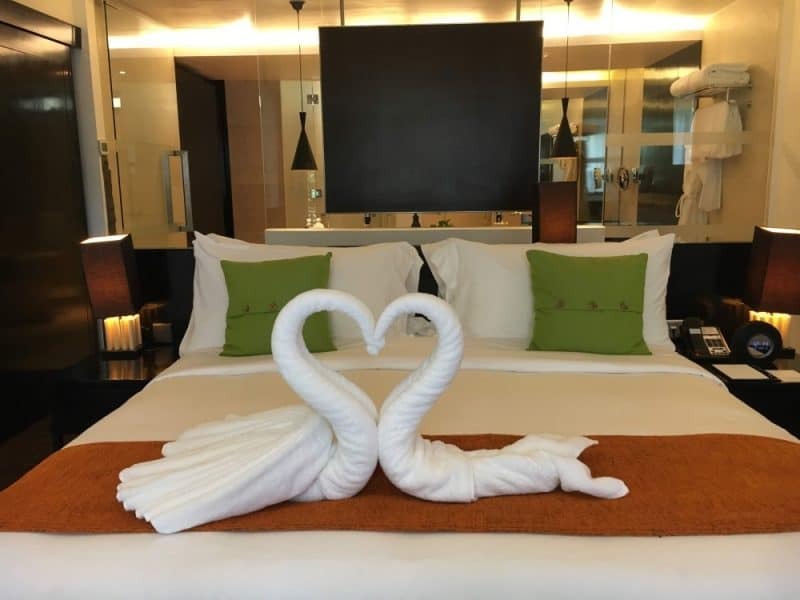 We recently took the opportunity to have a break from our new life in Penang with a short trip northward to the beautiful island of Langkawi and a two-night stay at The Andaman, A Luxury Collection Resort. 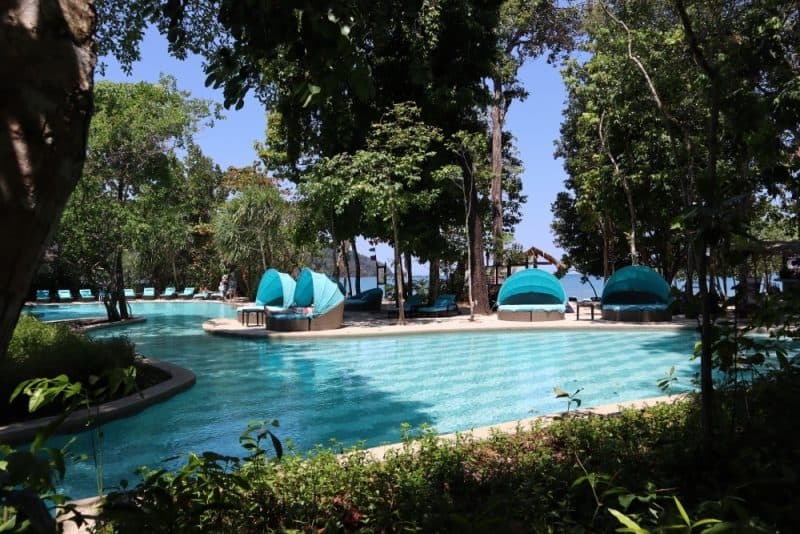 It’s an exceptional 5-star resort situated on the north-west tip of the island, surrounded by ancient tropical rainforest and located on beautiful Datai Bay, a private beach that National Geographic ranked in the top 10 in the world! 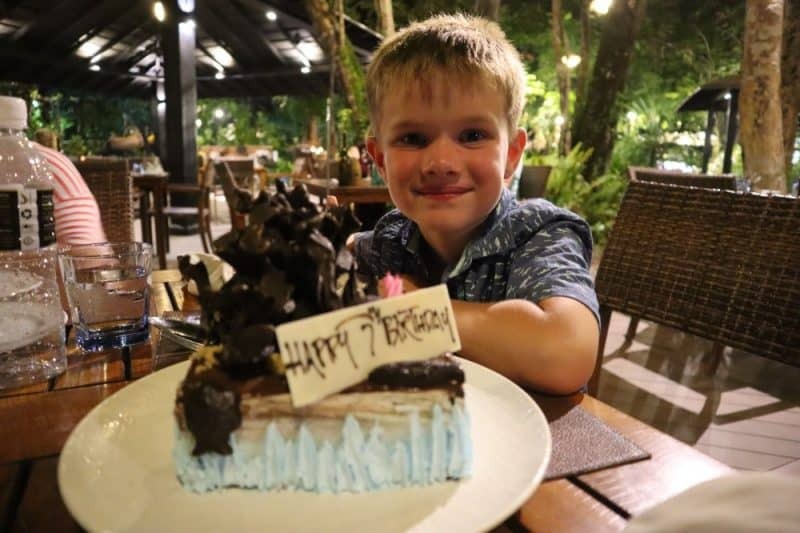 This was partly to celebrate Jack’s birthday, but also to make sure we didn’t leave Malaysia without visiting Langkawi, a place we had heard so many good things about. Here’s our review. The main building at the Andaman looking up from the pool. 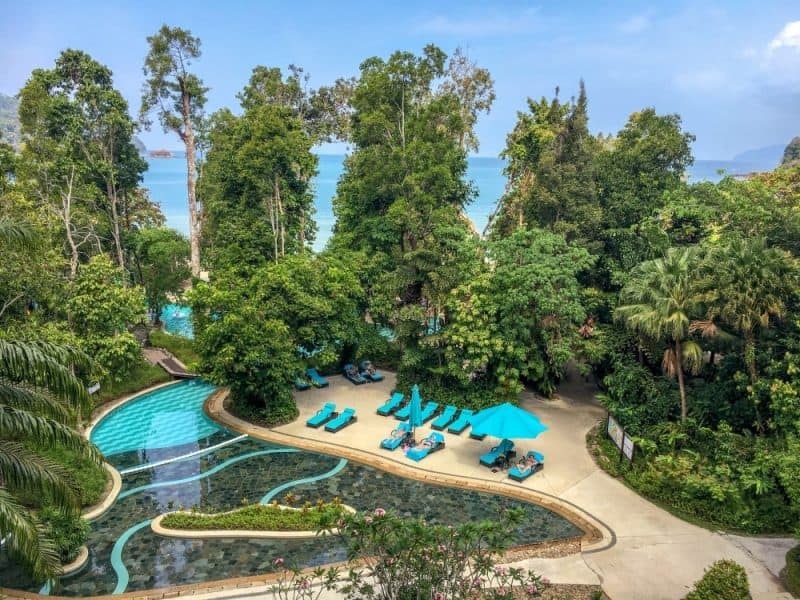 The Andaman is about a 45-minute drive from the Langkawi airport, through some beautiful forest – a taste of what was to come once we reached the resort. On our arrival, the guard on the front gate phoned ahead so by the time we had wound our way down the spectacularly forested driveway our Guest Experience Executive, Noraslina (Lina), was on hand to welcome us. Lina organised us a cool welcome drink and helped us through the check-in, which we completed as we took in the view over the pool and beach from the Jentayu Lounge. 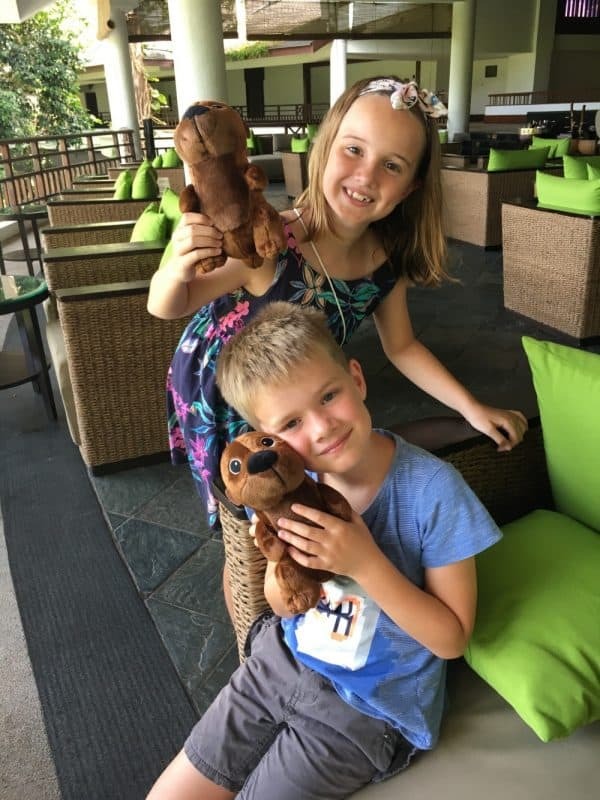 The kids were also presented with cute sea otter toys, the mascot of the hotel, which they loved! 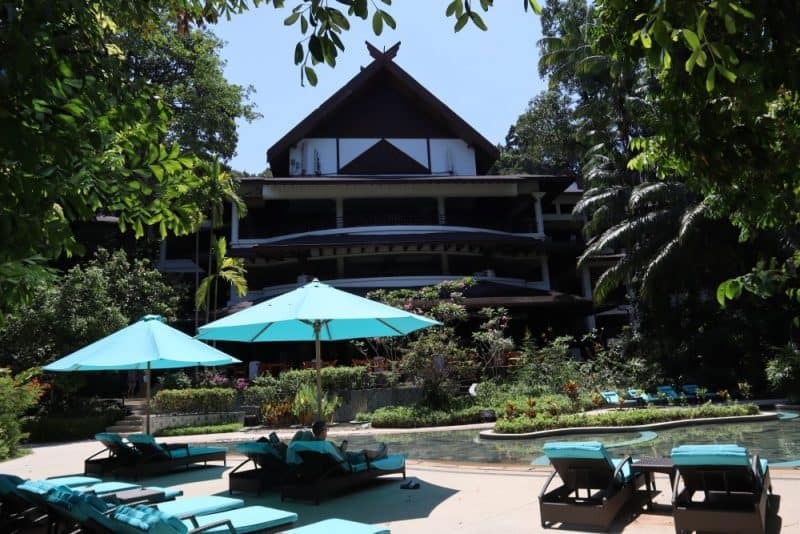 Once checked in, we headed off to our upgraded (thanks The Andaman!) Suite room on the western edge of the resort. 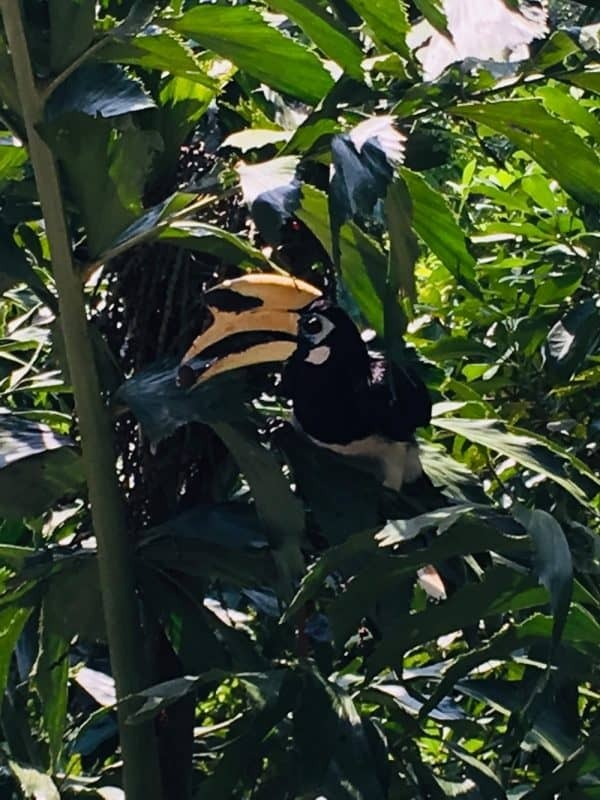 On the way to the room, we got to experience just how close we would be staying to the wildlife, with a great hornbill and a Sunda Flying Lemur (or Sunda Colugo) in close proximity to the covered walkway. Our room was very well appointed, with a generous living space encompassing a round dining table for four people and two couches. We made up one couch and got an additional portable bed for the kids, and there was still plenty of room available. The adults had a generous master bedroom with our own television, a good-sized writing desk and fantastic views – a peak of the sea through the beautiful trees. 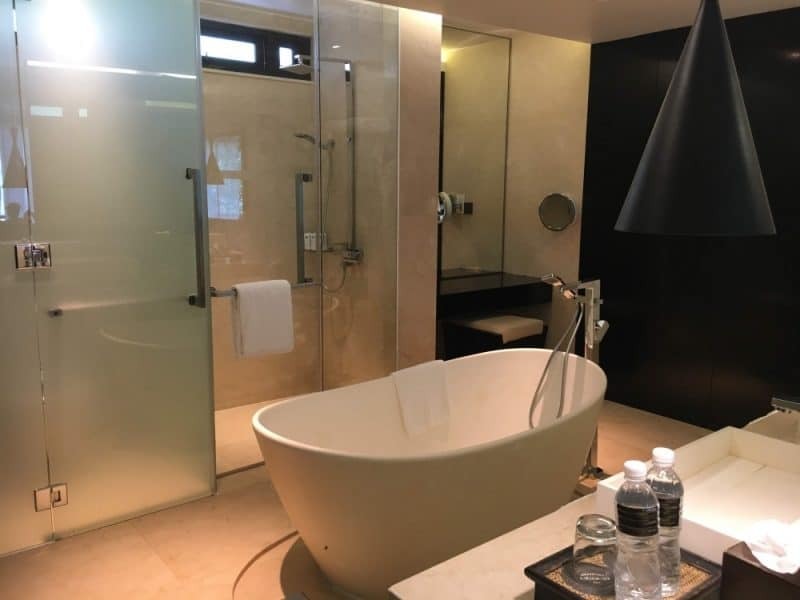 We also had a luxurious bathroom off the master bedroom, with a lovely bath as well as a separate shower. 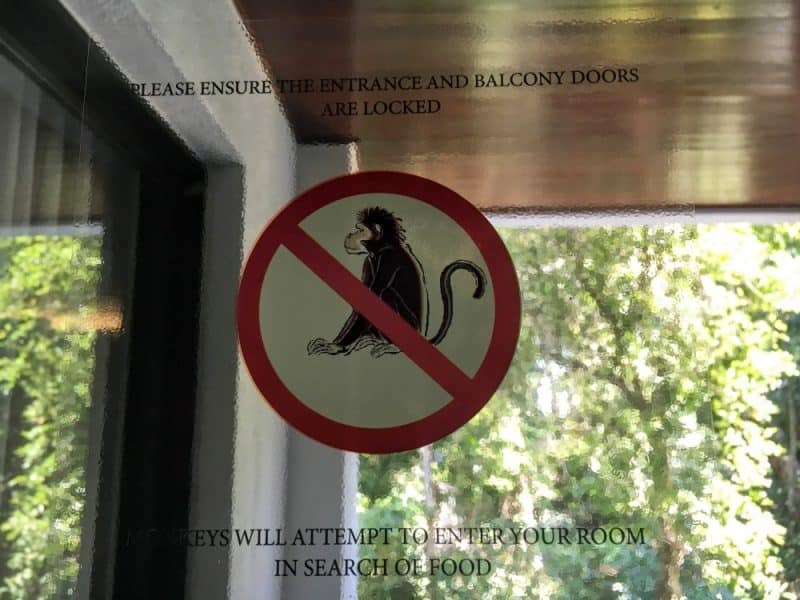 Outside we had a balcony with a day bed, though we kept the doors shut most of the time, partly to keep the room aircon working efficiently and partly to keep the monkeys out of the room (we were warned they might make a surprise entrance if we weren’t careful!). 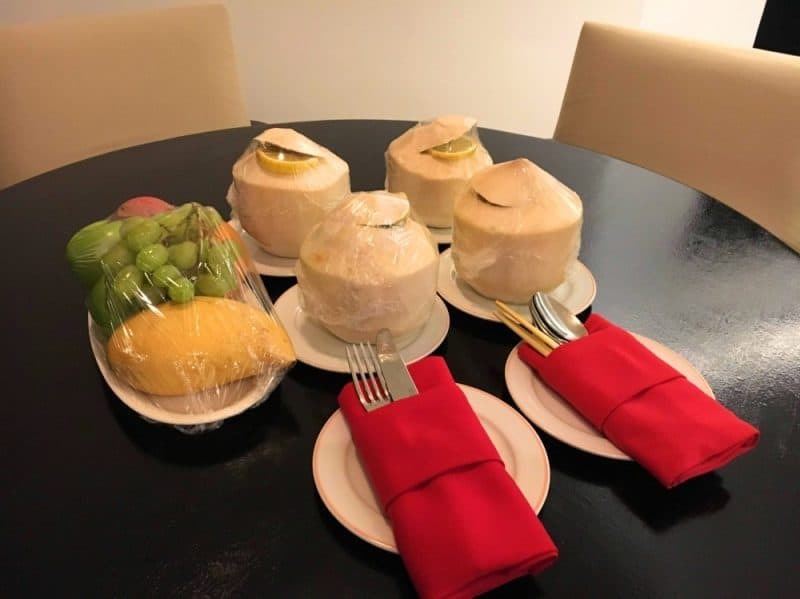 Delicious fruit platter and fresh coconut water delivered to our room. 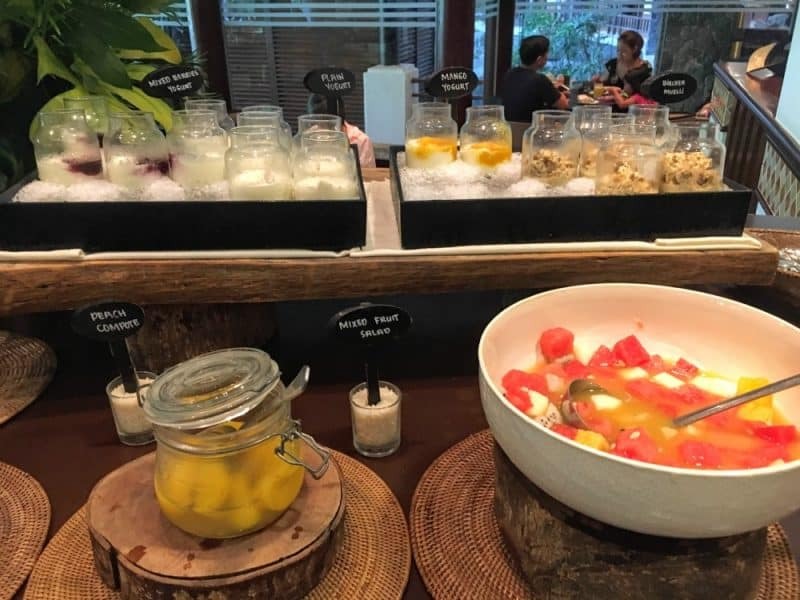 The resort has a number of eating options, with four restaurants and two bars. 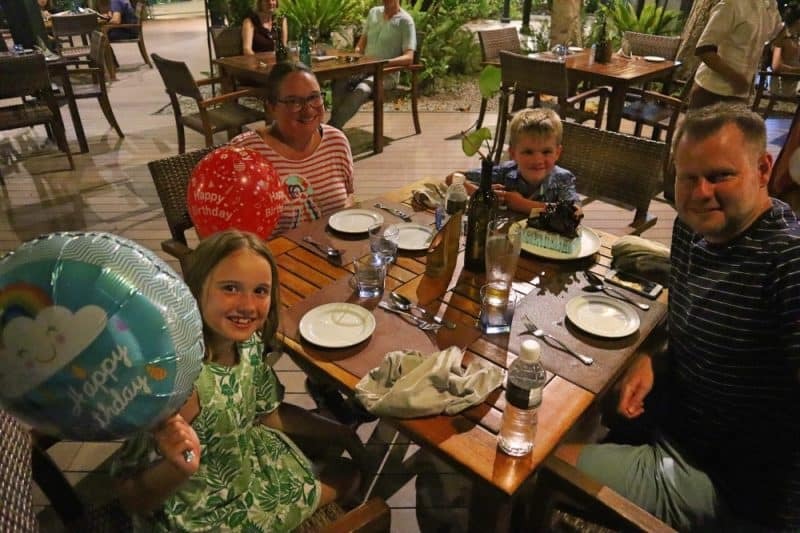 We opted for the slightly more relaxed Tepian Laut for dinner both nights, which was situated overlooking the beach and had very good burgers for the kids and delicious Malaysian and Indian food for the adults. 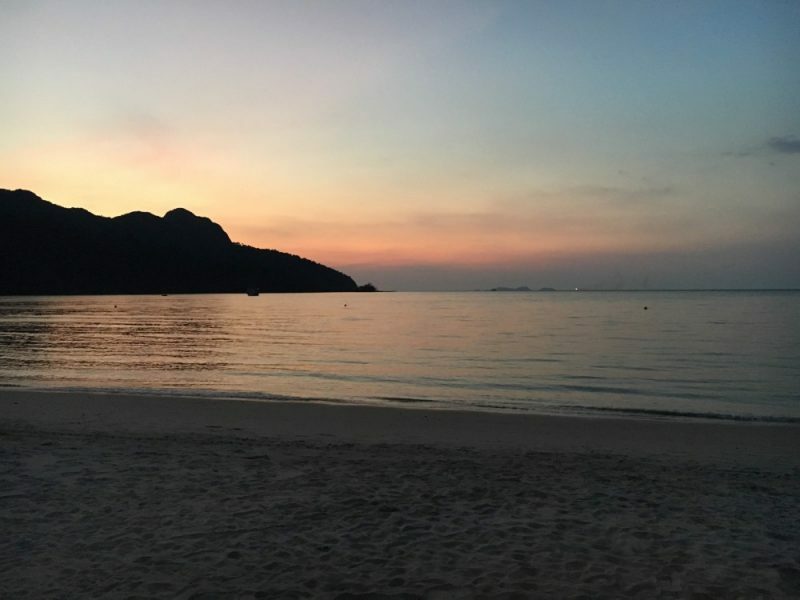 Yes, it was more expensive than eating at our local Penang restaurants, however the food was superb and the view of the sunset was one of the best we’ve ever seen. 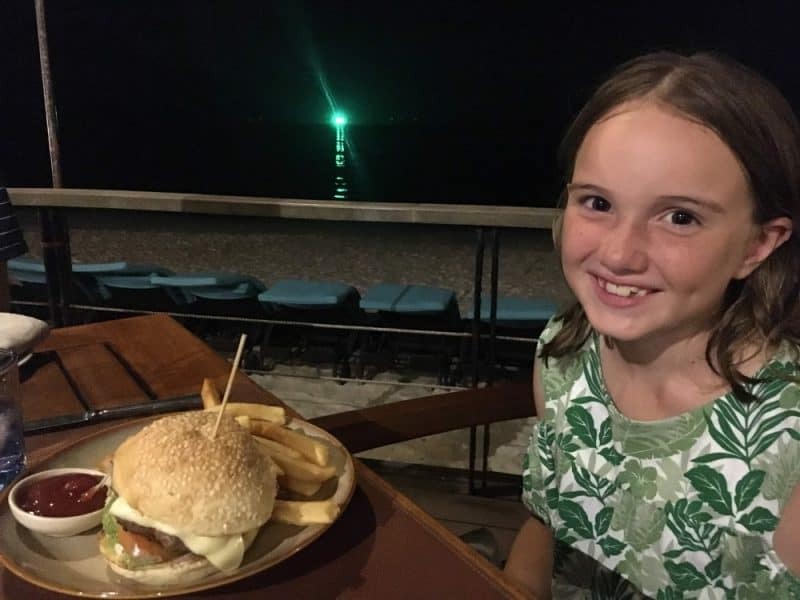 Very happy with her burger! We received an extra special surprise also when the staff brought out a birthday cake and balloons for Jack and sang happy birthday. His eyes bulged with delight as the specially designed marine-themed chocolate cake came to the table, complete with moulded coral, chocolate fish and the sea. It was a work of art! We also managed to squeeze in a couple of drinks at the Beach Bar each night. Happy hour runs from 5pm through to 7pm and provides a discount on the drinks equivalent to the temperature (in Celsius, not Fahrenheit unfortunately!). The cocktails were excellent and, again, the view over the beach was perfect. 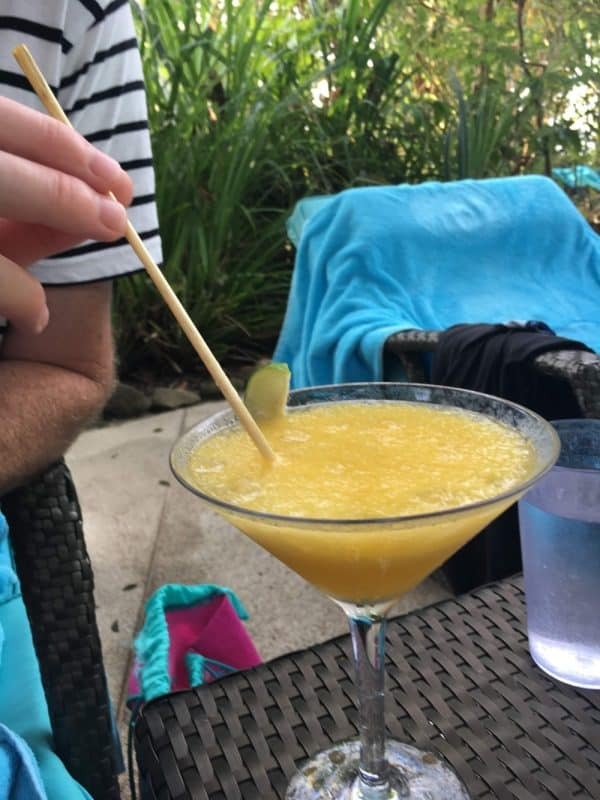 Loving those sustainable bamboo straws. 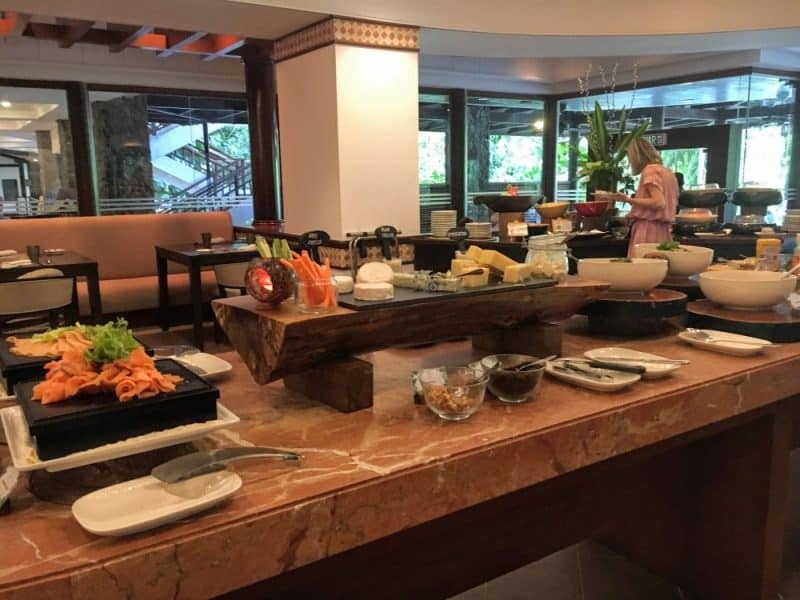 The resort had a second beachfront restaurant, Jala, which offered more refined dining specialising in seafood, as well as The Restaurant, and The Japanese Restaurant which are both located in the main building overlooking the pool area. 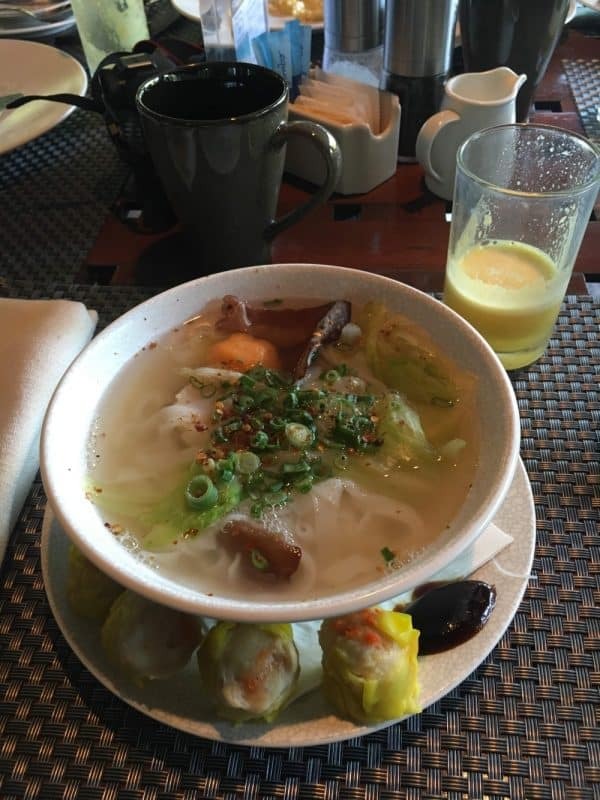 Delicious Asian style breakfast is on offer too. The Restaurant also houses breakfast, which offered everything you could wish for, including, amazingly, bread and butter pudding with custard – not sure that’s breakfast food, however Mike (and Soph) did partake (both days). 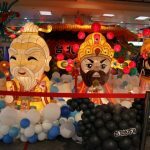 On our first night the Jala Restaurant hosted a spectacular looking seafood buffet, with tables set up on the beach, fire lanterns and a local cultural show. The Andman has some incredible facilities and activities, many of which are free to utilise during your stay. 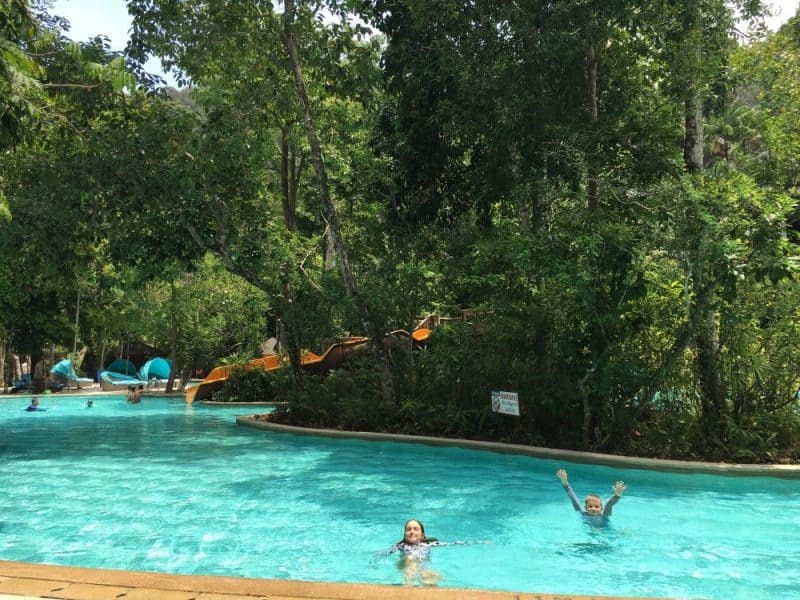 So many things to do at the Andaman! 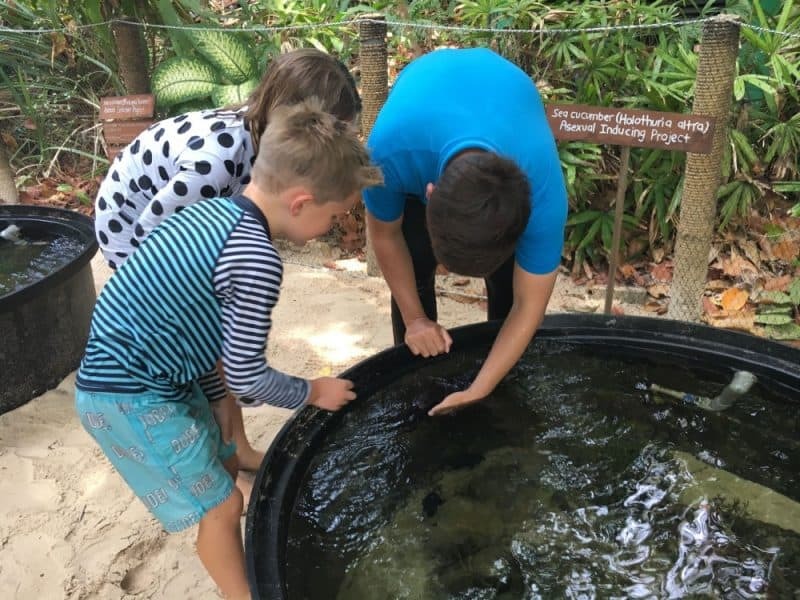 There was plenty on offer to occupy our time – some really interesting activities and a real commitment from the resort to manage and enhance its local environment. Can’t get enough of that pool. Luckily we also had time to enjoy the beautiful pool, camped on the daybed with a book in hand and a cocktail not too far away while the kids made the most of the pool and the slide. The kids (and adults!) loved the waterslide! Loungers and daybeds were plentiful, and split between the pool and the beach. Towels are provided as is chilled water that you can help yourself to, a great touch and one that helps reduce plastic water bottle use. 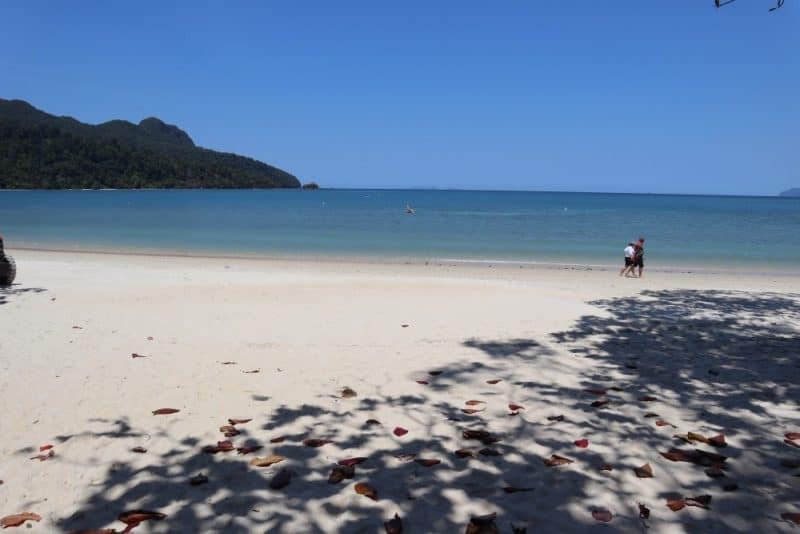 We also loved walking along Datai Bay with its beautiful soft white sand and clean beaches, and the sea was so warm! 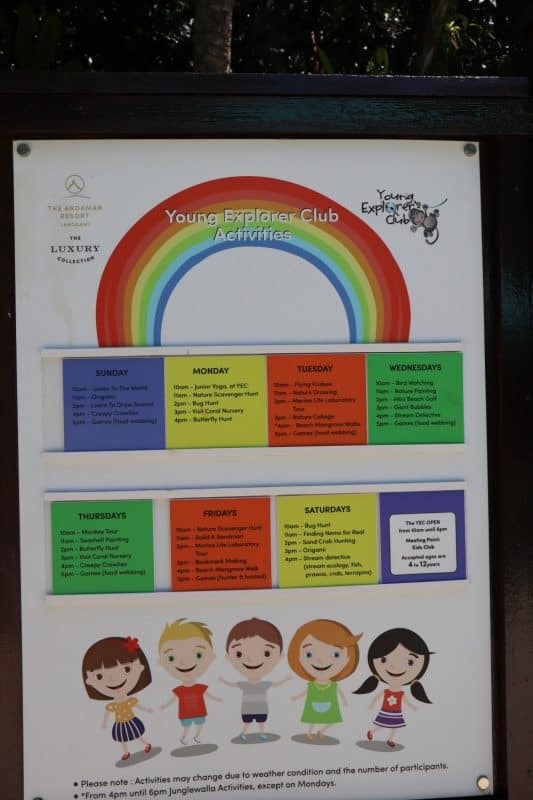 The kids club also has a great programme, with plenty to keep kids occupied throughout the day. 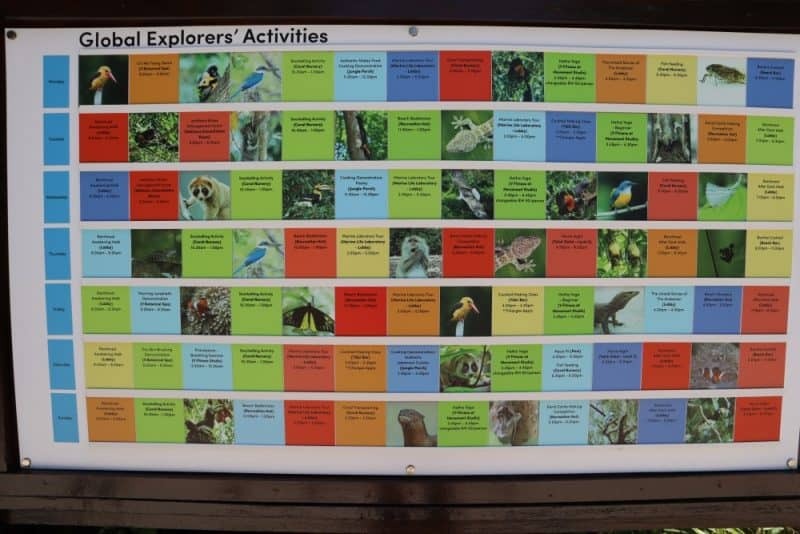 During our stay we opted explore some of the 10 million-year-old rainforest on our doorstep with an excellent (and free) hosted nature walk. To illustrate just how close we were to the wildlife, we never actually had to leave the hotel grounds, and we got up close and personal with great hornbill birds, geckos, monkeys and of course the Flying Lemur, which was up and active once the sun had disappeared meaning that we were able to see it gliding between the trees. 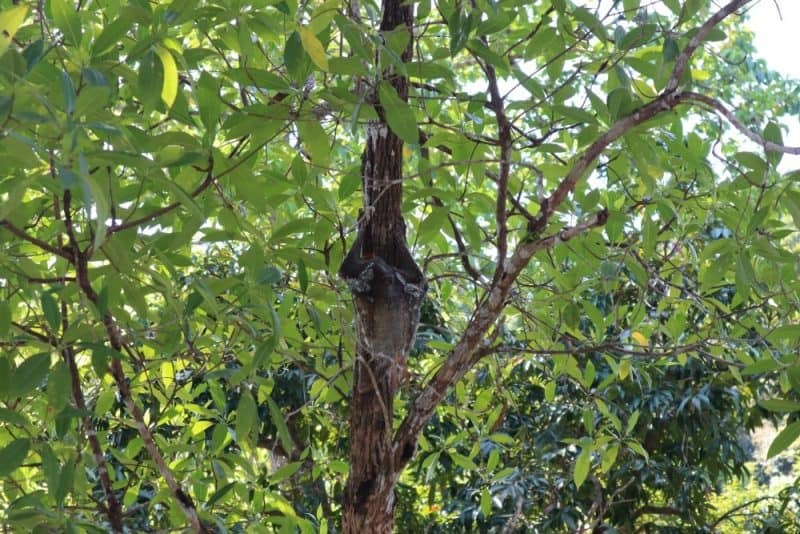 Can you see the flying lemur camouflaged in the tree? This was literally outside our door at the resort. The resort is also home to Flying Foxes or Flying Squirrels, and fortunately we also missed the Flying Snakes (though Soph was a little disappointed about that!). During the day we also spotted the hotel’s resident Monitor Lizard, he even had a short swim in the pool! 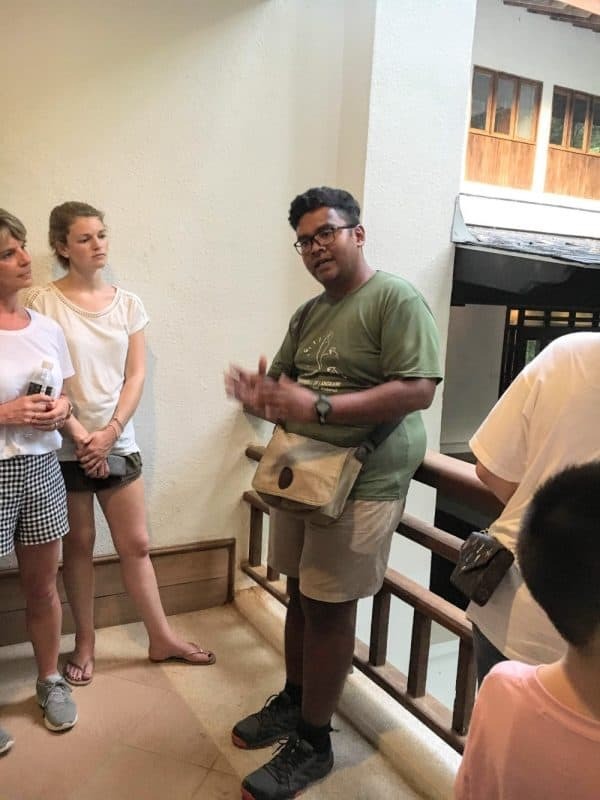 The Andaman also offers hosted walks and kayak trips through the mangroves to secluded swimming spots (and where you can see more of the local wildlife), as well as opportunities for photography and bird watching. There are also kayaks available to hire from the beach along with other water sportscraft like stand up paddleboards and hobycats. 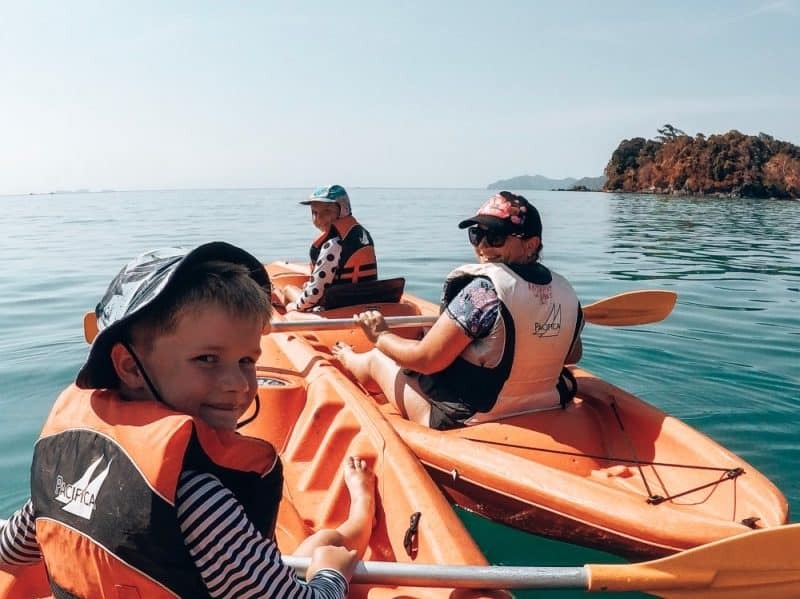 We paid 55 MR (around $13.50 USD) for a double kayak for an hour, and went across the bay to a tiny island just off the coast, with the kids honing their already well-tested paddling skills. If you prefer a little pampering, then the Andaman has an excellent spa that has absolutely rave reviews. Lina told us it is the highest rated spa of all Marriott hotels in the world! Unfortunately we simply didn’t have time to visit, but it’s high on our list for next time around. 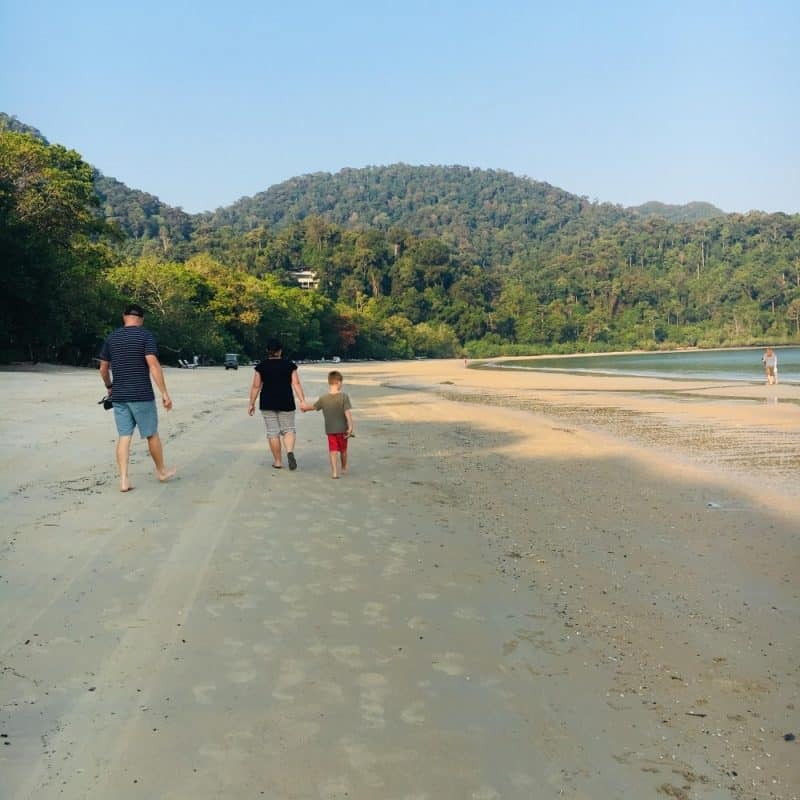 One of the key reasons we chose the Andaman for our Langkawi trip is the incredible marine biology and conservation programme they offer at the hotel – perfect for Jack our budding marine biologist! 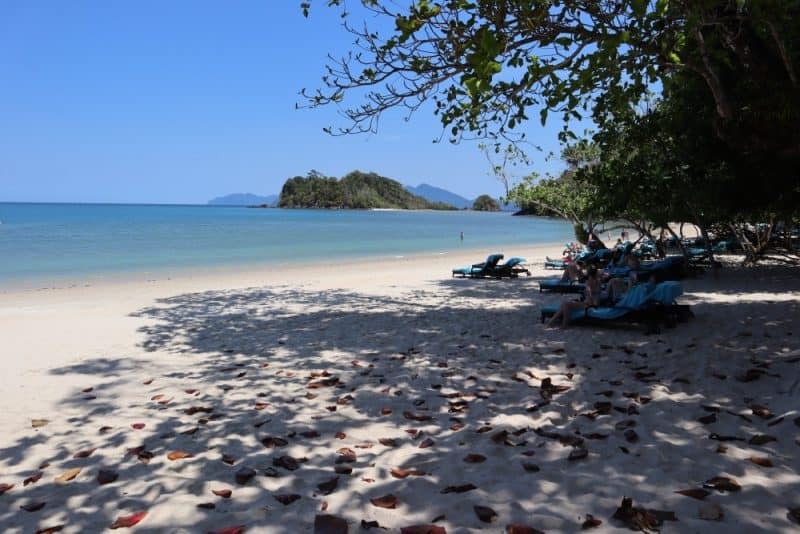 The resort is situated on the shores of Datai Bay, with an 8000 year old coral reef extending out from the beach, so there is plenty of sea life to see in the water even from a kayak, though snorkeling is definitely the best way to experience it. 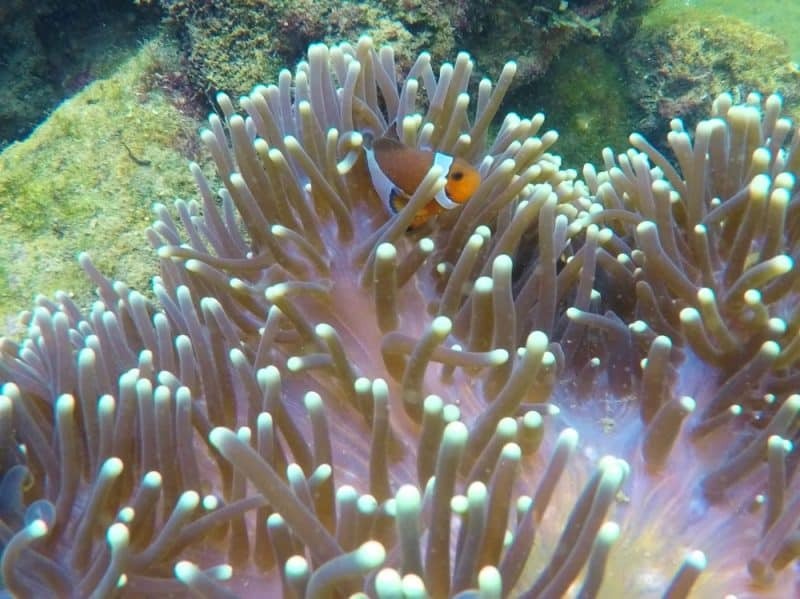 The reef itself was badly damaged during the 2004 Tsunami, however it played a large role in limiting the impact of the Tsunami by the time it reached the shore. Since that time The Andaman has developed a coral nursery to grow coral and then transplant it back to the reef. 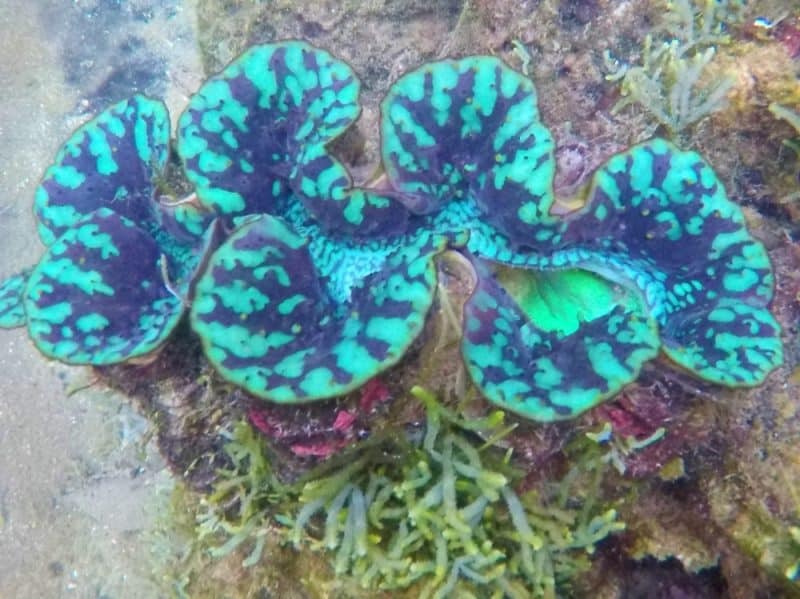 The nursery is open daily to guests between 10.30 to 13.00, with marine experts on hand to show you the coral, clams, sea anemones, sea cucumbers, starfish, sea snails and plenty of fish. The tour of the nursery is free and takes about 15 minutes. 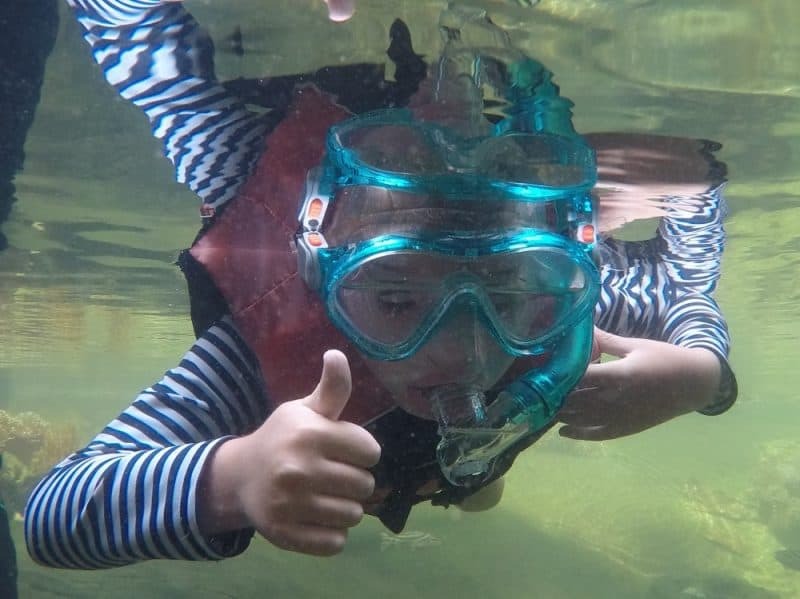 It’s a very serene experience that has you floating on the surface with a snorkel and life vest checking out this amazing underwater world, with very interesting explanations of what’s what from the guides. 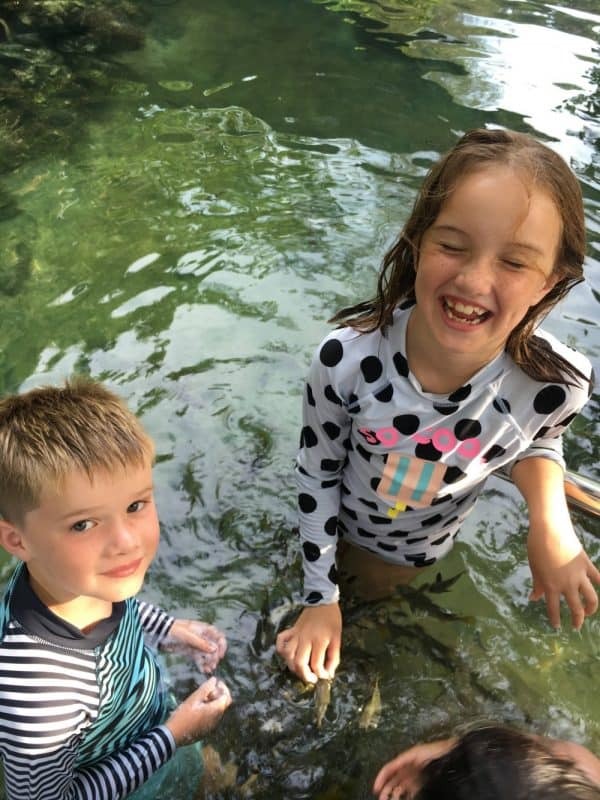 We did this every day as the kids loved it – the found it fascinating and actually developed a good relationship with the experts who really seemed to enjoy talking the kids through the finer details of all the animals. You could tell how passionate they were about what they do. We also learned about the importance of using reef safe sunscreen – many commercial sunscreens contain chemicals that are damaging and can kill coral. Why we need to buy ocean-friendly sunscreen! 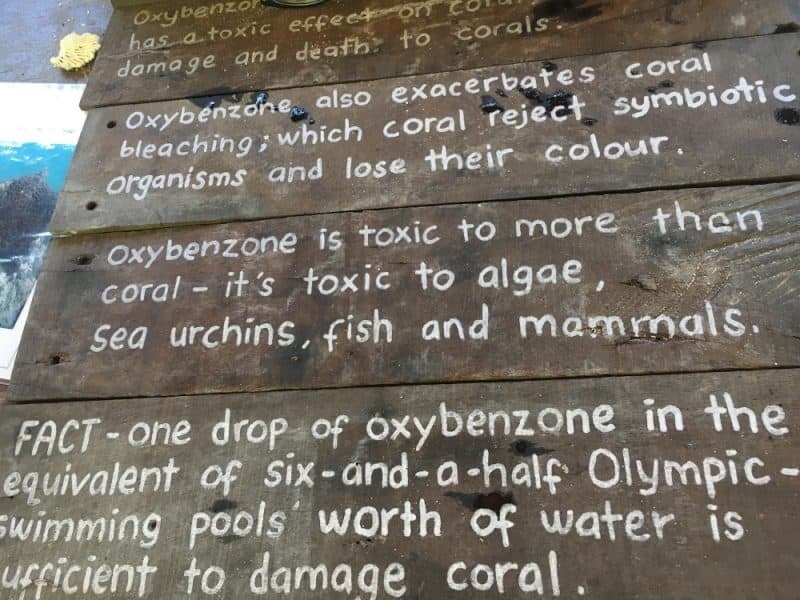 Did you know that one drop of sunscreen containing oxybenzone is enough to affect coral and marine life in the surrounding area the size of 6 Olympic swimming pools. From now on, we will only have reef-safe sunscreen on our shopping list when hitting the beach. 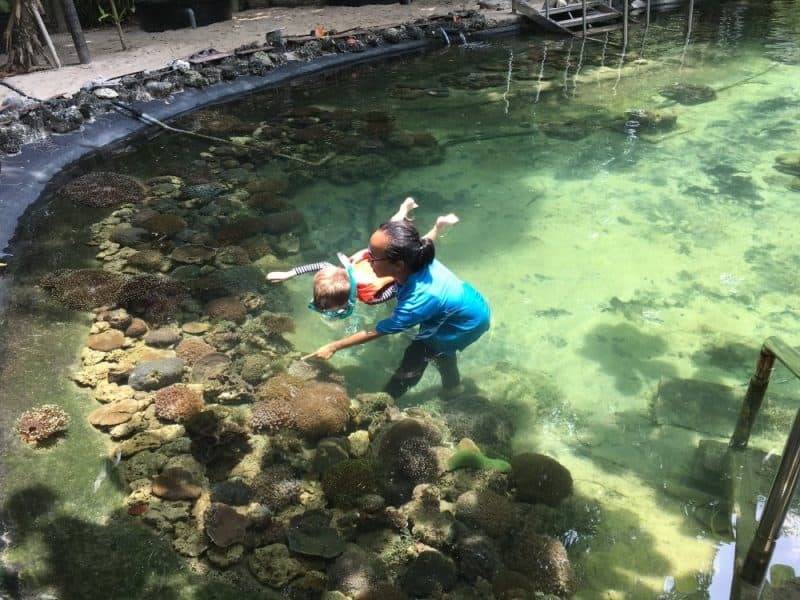 The nursery also hosts fish feeding every three days or so, which again the kids loved, with the fish literally eating out of their hands. They were in the water for half an hour and didn’t want to leave! 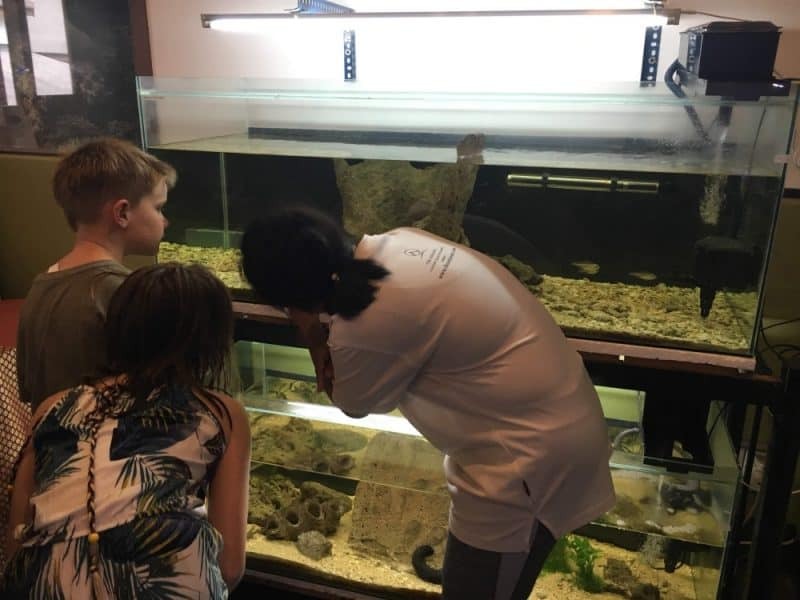 As part of its efforts to protect the marine environment and to act as an educational experience for guests, the resort also has a marine life laboratory which is open daily and manned by the marine experts from the coral nursery. 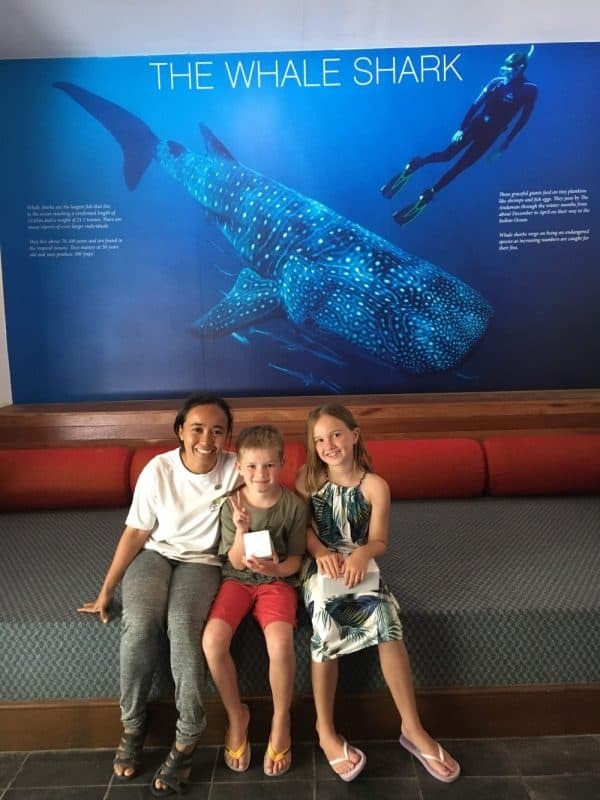 The kids went along on our last day and had a great time chatting to the staff and extending their burgeoning interest in marine biology. It was a brilliant short break from Penang. We were very sad to leave – we all said it was right up there as our favourite hotel ever, and we can’t wait to return one day. 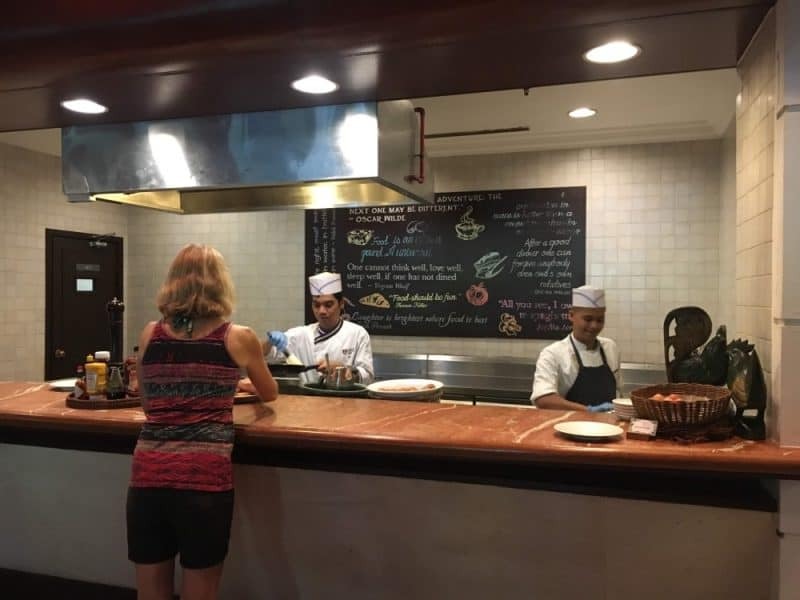 This was our first experience of a five-star resort, and the spectacular service we received from Lina, Rajah and the wider team at The Andaman throughout our stay really set this resort apart from any hotel we have stayed at in the past. 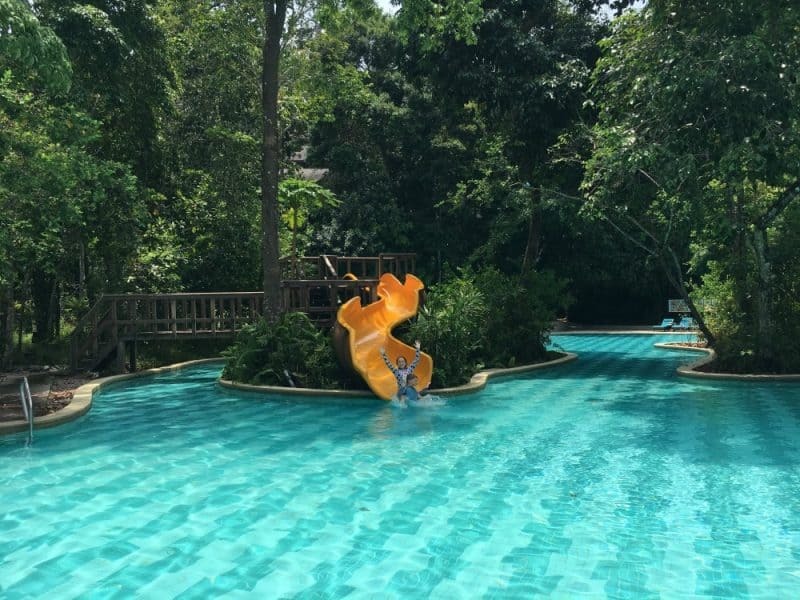 We’d HIGHLY recommend The Andaman if you’re looking for a family-friendly hotel that’s surrounded in pristine nature, a true eco-friendly ethos and with wonderful staff. 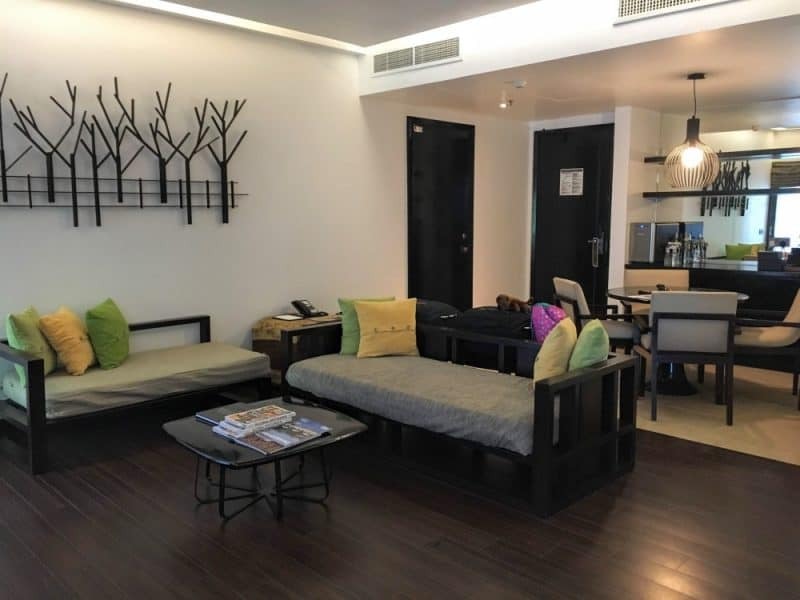 We booked the Andaman Hotel through the Booking.com website and got a great deal. Check prices and book The Andaman Hotel here. Disclosure: We paid for our stay at The Andaman Resort but were kindly gifted an upgraded room. As always our opinions are our own.